This beautiful Rhodonite pendant is set in a Sterling Silver bezel accented by a Celtic Triskele in the bail. It is accompanied by a 19″ heavy Sterling Silver chain. $159.00 including free shipping within the US. 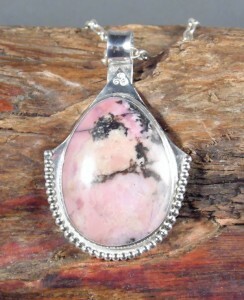 This Rhodonite Pendant in Sterling Silver is approximately 2 1/4″ tall, including bail.